For the first time in my life I had the pleasure of eating chestnuts roasted on an open fire! Holiday cheer filled the air at the annual Whitefish Christmas Stroll. Stores stayed open late and merchants offered goodies to entice shoppers inside. In the spirit of the season, shoppers pulled out their credit cards and charged full steam ahead! Entertainment was free with carolers, sleigh rides, jugglers, and more adding to the delightful festivities of the evening. We strolled along Central Ave. enjoying the sights and sounds when my eyes caught a sight of a man with a long gray beard and wisps of hair coming from under his woolen cap. There he was roasting chestnuts on an open fire! Oh man! This was my lucky day! How could I pass this up! My fascination with chestnuts had been going on for years because of Nat King Cole’s, The Christmas Song! Up until that very moment, I didn’t know if anyone every really roasted chestnuts or if it was simply a romantic lyric for a dreamy-eyed Christmas carol. Now was my chance to find out! I hadn’t a clue what chestnuts would taste like, or what I would think of them. I simply knew that I had to try one. I walked over to the man with the grill. The chestnuts were roasting in a pan over a bed of red-hot coals. I picked one up and delicately placed one of the nuts into my mouth. How do roasted chestnuts taste? My first impression on the taste buds was: soft – bland – squishy – potato-ish in flavor; similar to gnocchi. Not offensive, but nothing to brag about in my opinion. I wouldn’t go out of my way to eat them unless I was sitting on a bear rug in front of a fireplace having a mug of hot chocolate as Christmas carols played softly in the background. Nevertheless, my curiosity was satisfied! I could check this off of my bucket list! I was now in that number of people who ate roasted chestnuts at Christmas time! 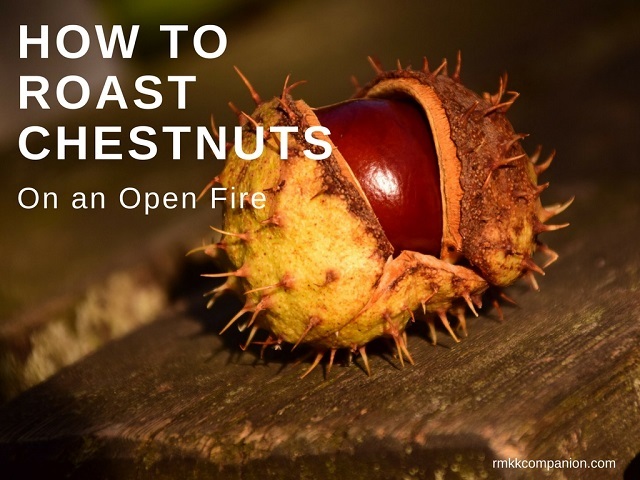 If you’ve never had roasted chestnuts and want to satisfy your curiosity as well, follow this easy recipe for roasting chestnuts on an open fire. Score an X on the round side of the nut. Prick the inner skin with a fork to prevent steam build up as the nuts heat up. Prepare your grill or another heat source. Place scored nuts in a cast iron frying pan flat side down. If using a grill, wait for coals to burn red hot, then place the pan with nuts on the grill. If using a fireplace or campfire, you need hot coals as well. Be sure to move your pan around so there is a bed of glowing coals for your frying pan to rest upon. Cook for about 5 minutes. Then, roll the nuts over, and roast for an additional 5 minutes or so. Time is dependent on how hot your coals are. When shells crack open, chestnuts are ready. Remove from heat, cool for about 15 minutes, peel brown skin, then eat and enjoy! Glacier Country, Recipes chestnuts, Christmas, Montana, Whitefish, winter. permalink.